The Edmonton Archaeological Society is the most northern centre of the Archaeological Society of Alberta. We are an Edmonton Group that promotes Albertan and Canadian Archaeology. Members of the Edmonton Centre meet at the Strathcona Branch of the Edmonton Public Library. The guest presentations start at 7:00 pm. Invited speakers discuss a variety of archaeological topics and events pertaining to the archaeology in Alberta and abroad. Those present are encouraged to comment and participate in the informal discussions. Click on the Speaker Series link for more information. 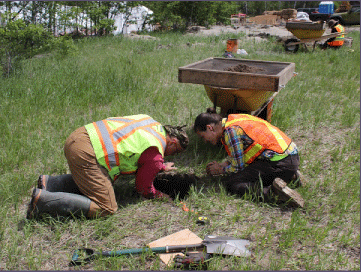 The Edmonton Centre also hosts a variety of archaeological fieldtrips and events for its members and the general community. Join them for the Brazear River Survey May 26, 2018! Click here for their latest newsletter!